Robin Hood Bingo has fast become one of the top bingo sites online. Since launching in 2012, Robin Hood has become a major player in the online bingo world, and with good reason. Their bonuses, exciting games, entertaining theme, and VIP benefits all combine to give some of the best value for money around. Lord Bingo easily rates Robin as a 5 star bingo site. Read on to find out why! 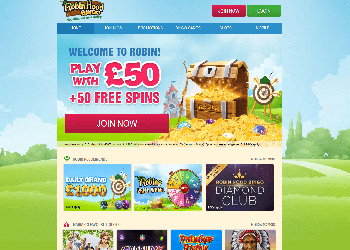 Robin Hood features one of the highest welcome bonuses of any online bingo site. Players can play with a fabulous £50 for only £10 + 50 FREE Spins! Plus, Newbies at Robin Hood Bingo can access Free Bingo for three entire days in The Biggie room where real jackpots can be won! The best part is that you can enjoy this free bingo treat before you even make your first deposit! Some of the top promos that players can enjoy include the Prize Wheel, a spin the wheel bonus with 12 amazing guaranteed prizes. Earn a spin on the wheel to win goodies like free coins, bonus cash, free spins, or a mystery prize! There are also loads of bingo games with mega jackpots like Pay Day Bingo and Self Made Millionaire where the prizes can reach up to £1,000,000! For Free Bingo lovers, there are 4 fabulously free rooms with real jackpots on offer. Play in The Biggie, The Grand, The Ultra, and the Supreme rooms for loads of free bingo and jackpots as high as £500! Robin Hood Bingo features a fantastic variety of fun bingo games. Of course they have classic 75-ball and 90-ball bingo games with massive jackpots. They also have plenty of fun bingo games with exciting progressive and guaranteed jackpots to win. Also, be sure not to miss out on the chat rooms and chat games where you can gossip all day and boost your wins with the bingo gals and guys. In addition to a fabulous variety of bingo gaming options, Robin Hood also features an amazing collection of slots, scratch cards, and casino games. Play free slots on the demo games and practice until you become a pro. Some of the top game titles include Fluffy Favourites, Sugar Train Slots, Irish Luck, Starburst, Cleopatra and many more! Robin Hood Bingo’s mobile site offers players one of the hottest mobile bingo gaming interfaces available. The mobile app is incredibly user-friendly and practically intuitive to use. In addition to playing bingo and plethora of instant games, players can also participate in chat rooms and progressive jackpot games. Robin Hood Bingo mobile is available on iPhone, Android, iPad and Tablet. 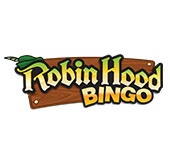 Robin Hood Bingo has an incredible selection of top mobile games. Unlike many mobile bingo sites that don’t actually offer access to their bingo games, Robin Hood Bingo offers access to a nice selection of 90 ball and 75 ball games. In addition, Robin Hood’s mobile App lets player choose from many of the top slot and instant games including Fluffy Favourites, Amazon Queen and Sugar Train slots. Play to reach VIP levels and join the exclusive Diamond Club. Make your way up through the four levels – Ruby, Sapphire, Emerald, and Diamond for increasingly bigger perks. Enjoy upgraded benefits such as real cash bonuses, extra cashback, special VIP games, and a dedicated manager just for you!